Streamline the creation and publishing of your annual Budget Book through a single source of budget data. It all starts with the integration between Questica Budget and CaseWare, leaders in public finance technology. Questica Budget Book powered by CaseWare is a user-friendly and comprehensive document management and financial reporting tool that allows your government agency to create, collaborate, edit, approve and publish an awards compliant Budget Book without the headaches of multiple spreadsheets/documents, version control issues, manual updates, and duplicating content/visuals such as charts, graphs, tables and images. 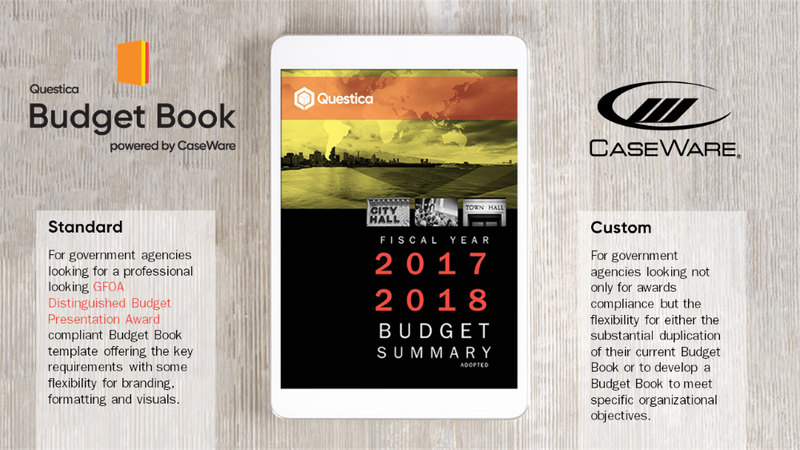 Questica Budget Book powered by CaseWare is a user-friendly and comprehensive document management and financial reporting tool that allows your government agency to create, collaborate, edit, approve and publish your annual budget book faster and easier than ever before. Our budget book integration brings together two leaders of public finance technology – Questica and CaseWare. Questica Budget is the leading budgeting preparation management software for government agencies, while CaseWare’s government financial reporting database driven solutions are trusted by over 400,000 users in 130 countries and is available in 16 languages. Unlike other budget book automation tools that use a spreadsheet application with a user interface, the integration between Questica Budget and CaseWare is not a spreadsheet upload – it’s a database driven solution with a direct transfer of data and information from your agency’s budget in Questica Budget to Questica Budget Book in CaseWare. Questica Budget Book is built with the Government Financial Officers Association’s (GFOA) annual Distinguished Budget Presentation Award in mind. We’ve taken the key requirements and built our Standard document to include those items – allowing small- and mid-sized agencies to prepare professional and compliant books that previously may have been unattainable due to time and resources. Since multiple individuals and departments need to contribute to annual budget and budget book, Questica Budget Book powered by CaseWare provides seamless collaboration through its workflow and security management feature, ensuring the right individuals have access to their sections, while giving reviewers and approvers version control and a clear history of any changes through the process. With Questica Budget Book, you get the power of CaseWare which along with strength of its single database, is a solution that supports a controlled, auditable, double-entry adjusting entry system. 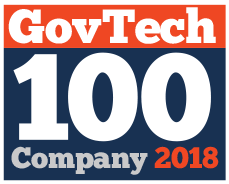 The solution supports the classification of entries, multiple concurrent grouping mechanisms, built-in diagnostics and rounding features, and automatic notifications when data or information doesn’t balance. Users can drill-down into the Budget Book report to review supporting documents to show which accounts comprise the value. Centralized tracking to questions, issues comments at all document or row/value level ensures no problems go unresolved. Questica Budget Book powered by CaseWare allows users to automate and easily update their standard data, documents, charts and graphics. Page numbers, indexing along with sections and exhibits are constantly updated to ensure the Budget Book is always accurate. With the ability to apply your agencies branding (logo, colors, fonts, page formatting) and other visuals (images) means you can produce and output a professional publish-ready PDF from the system (complete with bookmarks). The Questica Budget Book also allows users to export in XBRL format. The Questica Budget Book Team is ready to partner with your city, town or agency to develop and publish a Budget Book that not only saves time and resources but helps communicate all the great work you do for your citizens and stakeholders. Our instructor-led online training sessions are delivered by experts who have 20+ years of experience and a deep understanding of CaseWare products and best practice implementation of Budget Books, CAFR and other financial reporting requirements for the public sector. Plus, with Questica Budget Book, you’ll have access to all CaseWare’s international financial reporting content and resource library materials. Our Customer Success team serves as your advocate within Questica. Working from the onset, through implementation and ongoing usage, they are focused on maximizing your value from adopting Questica Budget, Performance, OpenBook and Budget Book. Through regular business reviews and touch points, Customer Success will understand and address your changing organizational needs, objectives, goals and challenges ensuring you and your organization have a bright customer experience. Plus, there are opportunities to connect with other users via user groups and events. Our team is full of fun and accessible budget experts, financial reporting professionals and business specialists. We’d be happy show you how Questica Budget Book can work for your organization with a personalized demo or sign-up for one of our free introductory webinars.